Forever Odd is the sequel to Dean Koontz’ best-selling Odd Thomas. The first book was great and I really enjoyed it. Odd Thomas is such a fantastic Character that I remember feeling a little sad when his adventure ended and I had to close the book for the last time. It’s good to get a chance to renew the acquaintance through Forever Odd and find out what the odd one has been doing. Forever Odd picks up the story a year after Odd stepped in and foiled the terrorists’ plan to blow up the shopping mall and lost someone very dear to him in the process. Odd is no longer working as a short-order cook at the Pico Mundo Grill. In his own way he is still trying to come to terms with what happened the previous August. He remains very chummy with the ghost of Elvis—who still crys a lot—and there are plenty of other apparitions flitting in and out of his life. In fact, in the very first chapter, Odd wakes up to discover that he has a ghostly visitor in his room. Odd knows the guy: Dr Jessup, but he didn’t know that the doctor was dead and realizes that the apparition must be very new to the world of the no longer living. Odd gets out of bed and walks to the doctor’s house, filled with worry over what he might find. He knows that Dr Jessup is dead, but what of his step-son, Odd’s friend, Danny? Once he is inside the doctor’s house, Odd finds the body that he had been expecting, but no Danny and Odd’s search for his friend forms the main storyline of the book. Odd might . . . well, an odd kind of a guy, but the people he encounters in his search for Danny are not just odd, they are downright strange; not to mention very evil and they will stop at nothing to get what they want. A lot of the characters from the first book make a reappearance in Forever Odd: Police Chief Wyatt Porter, P. Oswald Boone the overweight writer with the big body and a heart to match, and let’s not forget Ozzie’s cat, Terrible Chester, who is still as intimidating and unpredictable as ever. Terri Stambaugh—who owns the Pico Mundo Grill and has copy of every record that Elvis ever released—graces a couple of chapters with her presence as well. For the most though, the story concentrates on Odd and Danny and his abductors. I enjoyed reading Forever Odd. It is a well told tale and there is a lot of humour worked into the story, making it very entertaining. I think I enjoyed the first book more than its sequel, but that is neither here nor there. 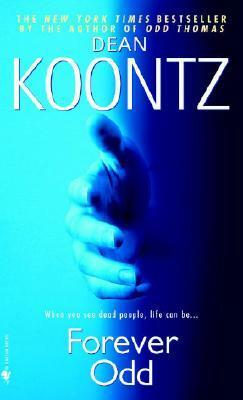 I would recommend that anyone who is planning on reading Forever Odd should read Odd Thomas first. If they didn’t the first few chapters of Forever Odd might be quite confusing for them as they probably would not know what is going on. In fact, the copy I read was a second-hand one that I picked up from the market and the book’s previous owner had written two things in the front cover of the book: ‘Date bought’ and ‘Comments.’ The date that he/she had bought the book was 05/09/06. The comment was ‘Confusing.’ I read the first three chapters of the book and became pretty sure that the last reader must have been unfamilliar with Odd Thomas. If I had not read Odd Thomas I would have been confused too. Forever Odd is 420 pages long and it’s a very good book, but do yourself a favour and read Odd Thomas first.